These Plastic Ice Buckets are perfect for bars, restaurants, clubs, fraternities, sororities, promotions, special events, and much more. You can choose from five different styles of Stock and Custom Imprinted Ice Buckets in a range of colors, shapes, and sizes. 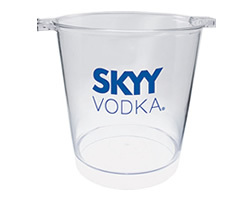 Our Stock and Custom Ice Buckets are made of durable styrene and other plastics to ensure long use. 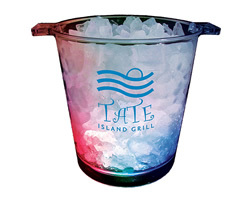 Each Custom Imprinted Ice Bucket features your design in any imprint color you choose. Over two dozen different imprint colors, as well as PMS color match imprints, are available. Full color "decal" custom designs are also available for our IB1200 Customized Ice Buckets. These Novelty Ice Buckets, Custom Ice Buckets, and Lighted Ice Buckets add a unique and fun touch to any event. Your satisfaction is guaranteed when you order Custom Barware from us. Please click on the links below to learn more about a particular Ice Bucket. For more information on any of our Ice Buckets, please feel fee to contact us at 1-800-233-0828.